Summary : This shop -- which specializes in bread but also serves pizza -- serves up tasty Roman pies which are served by their weight. It's nothing too go out of your way for, but a good example of standard Roman fare. After an underwhelming introduction to pizza in Rome at Dar Poeta, I set out to find a place that was worth recommending. As I’ve previously mentioned, I did a lot of research prior to my trip and knew I’d only be able to make a small dent in the long list of places I wanted to hit up in both Naples and Rome. Nevertheless, I wanted to try at least one completely random place that was off my pizza radar. In other words, I hoped to wander into a spot with no prior knowledge about the pizza there. There were so many places I passed throughout my trip that were serving pizza which looked appetizing, but I often had to restrain myself from going inside, as I was generally full or on my way to eat pizza elsewhere! On Monday afternoon, however, I was strolling down an alleyway near the center of Rome when I came across Forno Marco Roscioli (34, Via Dei Chiavari, 066-864-045). It was about 4PM and I figured I could use a light snack between lunch and dinner. What looked particularly appealing about the shop was that they specialize in bread. I assumed that a bread store that serves pizza would put a special emphasis on creating a great crust (like Sullivan Street Bakery!). Unlike at many pizza shops in the United States — where you can order individual slices from a round pie — it is common to serve pizza by its weight in Italy. In other words, you choose what type of pizza you want and about how much of it you’d like. The person behind the counter will then cut off a portion, weigh it, and charge you based on its weight. These type of pies are generally rectangular. Although this might seem odd to a tourist from the United States, it actually make a lot of sense to me. There’s nothing worse that ordering a slice and ending up with the smallest one in the pie. The system in Italy ensures that you pay for what you order. A pizza with toppings obviously weighs more and, in turn, is more expensive. There was an nice serving of a standard cheese slice remaining on the counter so I decided to order that. It was thrown into the oven to be reheated and then folded in half and handed to me, as if it were a pizza sandwich. Below, you’ll notice, I unfolded the slice so you can see what it looks like. Indeed, it was very greasy! The crust was crunchy and slightly charred. Of all of the pizza I ate throughout my trip, it most closely resembled a standard New York style slice. 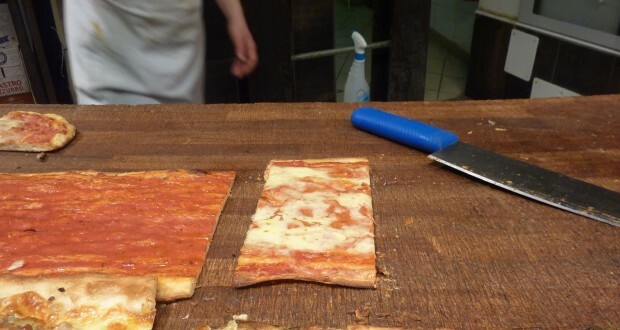 It came out to €2.30 (about $3.00) — just about what you’d pay for a similar size slice in New York City. My only complaint is that it wasn’t reheated well enough, so essentially I was eating a lukewarm pizza sandwich. I wish I could tell you that I discovered a new hidden gem along Rome’s cobblestone alleyways. Unfortunately, that wasn’t the case. I was, however, impressed with the pizza. I always tell people that you can walk into any slice joint in New York City and the pizza you’re served will generally be as good as — if not better– than what is considered quality pizza in other parts of the country. It’s my inclination that the same theory holds true for Rome. Although there are standout pizza places throughout the city (none of which I made it to), you should be able to satisfy your pizza craving by walking into any random pizza place and ordering whatever looks good. After all, it’s difficult to go wrong when you’re walking through the ancient streets of Rome. Previous: The 2011 NYC Pizza Run: Details & Tickets!